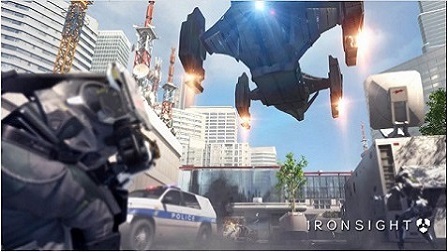 We had a chance to play the Ironsight beta and we can definitely say this game is a lot like Call of Duty, Counter-Strike and Battlefield while still having enough unique elements to be its own game. 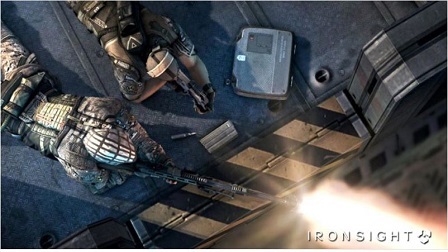 Ironsight is a futuristic military first-person shooter that follows the tried and tested formula of recent FPS games by offering multiple game modes, large weapon variety and great maps with stunning graphics that will leave you impressed. The game is being published by the Gamigo group which is a leading gaming companies in Europe and North America with more than 100 million registered user accounts and around 200 staff members in across USA, South Korea and Europe. The first impression you get from the game is that it’s like Call of Duty – a lot like Call of Duty. From the get-go, the game is modeled to act like your everyday FPS shooter but what really makes it standout is the fluidity and the action packed gameplay. Ironsight is by no means an attempt to capitalize on the current FPS craze but rather delivers what you would expect from an AAA game. What needs to be noted is that even though the game is currently limited, the game has been announced to be Free To Play when it launches sometime next year. From my time playing the Beta, I had little to no issues with the controls or encountered any bugs or glitches that would render the game unplayable or require me having to restart the game. There are a variety of game modes you can choose from which include your traditional Team Death Match and Team Play while many more are expected to be added when the full game launches next year. The maps are small and very detailed. What truly is remarkable that the maps never feel empty or cluttered which just goes to show how much detail has been given to the design of each map. There’s just enough room for fast-paced gameplay while having just enough structures and items to get in some of that stealth gameplay by leaving a lot of room for camping and tactical warfare. Another major change is the dynamic weather conditions. Each map will have changing weather conditions that will affect how the game plays out. Though this might not be that big of a deal initially but when the fog hits and your view becomes limited, it makes the game much more engaging and unpredictable further adding to the fun factor of the game. The maps I played during the Beta experienced rain and fog effects which drastically changed the feel of the game. Another thing worth mentioning is that there are some elements of a map that can be destroyed, like old Battlefield games, so if you hate people that hide behind cover a lot rather than taking part in fast-paced gameplay. Another major draw for the game is its massive weapons arsenal that puts most FPS games today to shame. With over 100 hundred weapons from different categories, you can expect to find more weapons than the generic rifles and shotguns most FPS games today offer. You’ll have your primary and secondary weapons along with being able to call support after racking up a few kills. Besides the traditional EMF that lets you know where the enemies are you can call in drones that home in on your enemies and take them down. 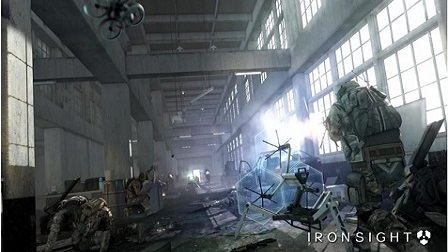 There is expected to be a larger variety of drones with different functions that will be added to the game down the line. Ironsight is absolutely gorgeous to look at which you wouldn’t normally expect from a free to play game. Every bit of the game is highly detailed which looks incredible on higher resolutions which are most evident in larger maps. The textures are detailed and the color pop putting it right there along the sides of Counter-Strike: GO in terms of graphics. Besides the great graphics, you’ll be happy to hear you don’t need a very high-end PC to enjoy them. Even with one of our mid-priced gaming PC’s I was able to run it on a smooth 1080p resolution with a constant 60FPS on the highest setting but considering it is the Beta more graphical updates might be included in the full release. 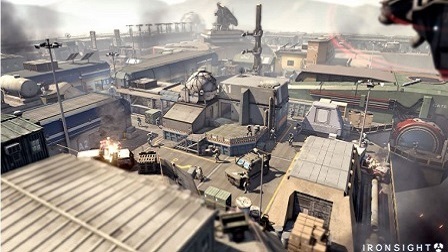 Regardless, if you like an FPS that looks good and plays just as well, Ironsight might just be your cup of tea. The player characters are detailed with a variety of customization options. Naturally, from a free to play game you can purchase cosmetics for your characters and buy weapon skins. You can also complete a variety of daily missions to unlock weapons and skins. The loot boxes in this game don’t affect progression and are only for cosmetics so you don’t have to worry about it being Pay to win which is something we all can appreciate. Ironsight is an ambitious FPS game that manages to deliver AAA quality while being truly free to play. With gorgeous graphics, fluid gameplay mechanics, gameplay modes and a large variety of weapons and customization options, this is a game that everyone can enjoy. Ironsight delivers fully on its promise of a faithful, polished, and better looking FPS game that manages to blend the best characteristics of the most popular FPS games without losing its own identity. 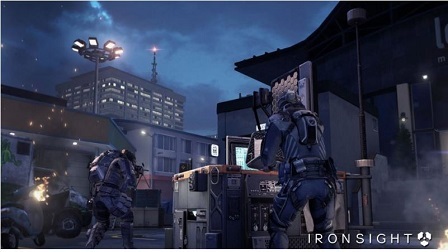 Ironsight will be releasing next year on the PC. You can register for the game here.